About Celine's Budgeting I have an every payday salary. Every payday, I know how much I should expect in my bank account, how much is budgeted for each expense, and how much I should have left. I usually spend 5-10 minutes a day, tracking how much money I have left and whether I saved a few dollars out of my allocated funds for the day. With this idea, Penny was born. Introducing Penny Jomar wanted to play around Actions on Google and he asked me to think of a possible assistant. 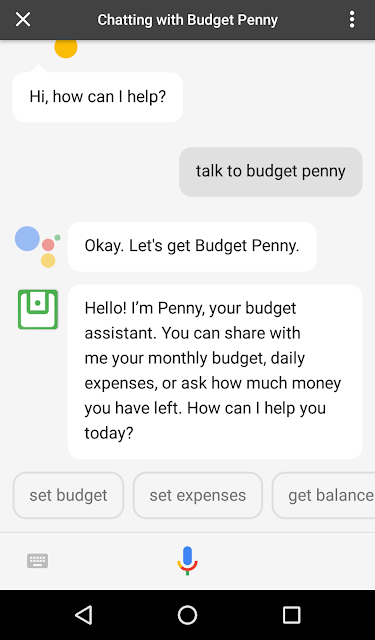 Since I would love an assistant to keep track of how much money I have left, a budget assistant was on top of our list. It took us a while to agree on a name (Loonie, Toonie, Centi, among others) but agreed upon Penny.